English speakers love metaphor. There are literally thousands of common expressions that make metaphorical comparisons. One category involves parts of the body. Elbow room, lend a hand, and seeing eye to eye are just a few examples off the top of my head (Oops, there’s another one!) 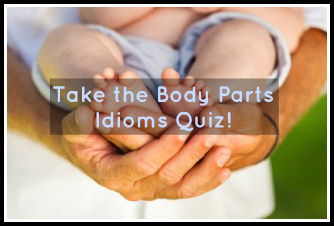 All of the following are common metaphorical idioms referring to body parts. Can you fill in the blanks? I’ll post the answers in a comment. Hint: There are no repeats. Note: I got many of these from Richard Lederer’s The Play of Words. I’ll share the answers in a comment. Tell me how you did. And feel free to offer others. Ouch. I hope you’re not superstitious, Will! I only got 12! I’m stumped…share the answers soon! Whoops, didn’t realize that first comment was posted!